A buddy of mine contacted me not too long ago about a new project he was working on called Sticktionary. 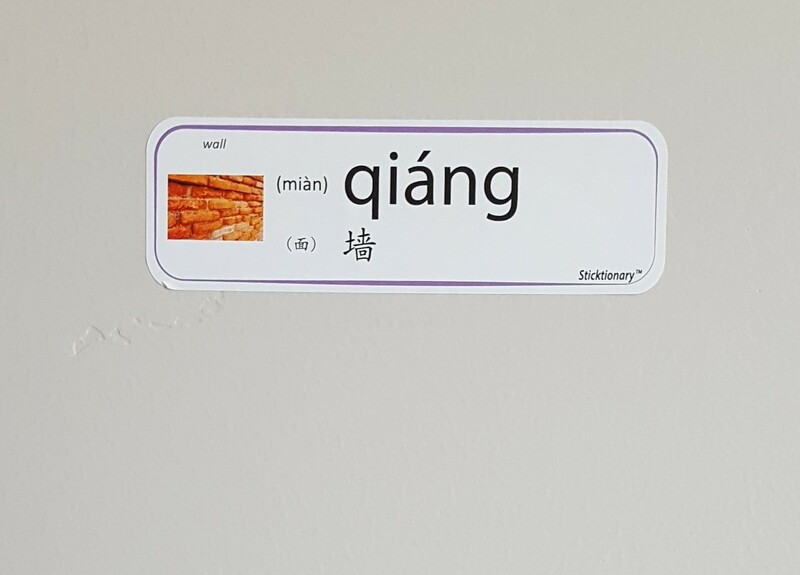 It piqued my interest immediately, since one of the methods I used back when I first started learning Chinese was contextual “stickers” placed on objects around my dorm. So, let’s take a look and see what new value can be brought to a classic method of learning! On each sticker, you’ll notice they added the measure word for each item in parenthesis just before it. This is a really smart addition and really helps to reinforce what measure words to use for each item. One thing I also liked was the de-emphasis on the English word, but still leaving it on the sticker for reference. This is especially good for stickers placed on smaller items that may have one or more parts, such as with cord and plug above. One thing I wouldn’t have minded was keeping the picture of the object off of the sticker entirely and placing it, perhaps, next to the sticker on the page in the book. The image seems redundant when the sticker is placed directly on the object you’re looking at (and can even contradict itself, such as the brick wall seen above when it’s actually placed on a painted wall). So how does they hold up in use? I tried placing the stickers on a variety of surfaces, and checked for a few things such as ease of placement and removal, and visibility from a distance. The above two surfaces were the ones I was concerned about the most, because you never really know if these kinds of stickers will end up tearing off your paint when you go to remove them. I left them on there for a few days to see how easy they would be to remove. I was pretty impressed, they actually peeled off easily and didn’t take any of the paint with them. Of course, YMMV depending on the surfaces you place them on, but so far I haven’t run into any issues. As for visibility, the Pīnyīn is clear and readable at the distance, and I had no problems making out the tone marks. The free iOS companion app (there’s no Android version as of yet) is probably the most valuable addition to this book. With the app, you do get nice features like a search function and a little quiz to test your knowledge. But perhaps the most important feature is the addition of the audio–this way you know for sure you are pronouncing something correctly. While there is still some room for improvement, the app is actively being worked on. Overall, having an app that works alongside the stickers is a huge benefit, and takes the guessing out of pronouncing the words. If you have the $50 to spare (introductory price at the time of this writing) I would definitely recommend Sticktionary for new learners of Chinese or for those hoping to brush up on their around the house vocabulary. The addition of the measure words to each sticker is very valuable, and ensures you’ll have the right measure word in mind as you learn. As of right now, there’s only a Simplified version available, and the app only supports Simplified. In addition, if you’re more biased towards learning the characters (which I am) you may find the emphasis on Pīnyīn on the stickers an unfortunate distractor away from the characters themselves. Find out more or purchase online at the Sticktionary website. Thoughts? Questions? Leave them in the comments below! I’m especially curious if anyone has used the sticker method before, and what your thoughts are on it.